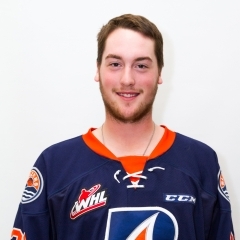 The WHL has fined the Kamloops Blazers $500 “for comments from player following game versus Kelowna on April 2,” according to the league’s website. during the Blazers’ 4-2 season-ending loss to the visiting Kelowna Rockets. If you’re late to this, Kelowna had a 2-0 lead midway through the third period when Kamloops F Deven Sideroff, his stick in the air, deflected a point shot past Kelowna G Michael Herringer. The call on the ice was a goal, but the officials went to video review in an attempt to determine whether Sideroff had made contact with the puck with his stick above the cross-bar. The replays shown to the crowd on the scoreclock video screens were inconclusive, so there was much consternation in the stands when the goal was disallowed. Bruce Hamilton, the owner, governor, president and general manager of the Rockets, was in the Sandman Centre. He also is the WHL’s chairman of the board and is generally seen as the league’s most powerful individual. Obviously, the WHL couldn’t allow Ingram’s comments to skate with no reaction, thus the $500 fine to the Blazers. However, the WHL likely could have saved itself a lot of grief had it had someone explain things to the media both before and after the game. The game was to have started at 7 p.m. However, there were a couple of terrible accidents, one of them involving a fatality, on the Coquihalla Highway between Kamloops and Vancouver that resulted in it being closed. As a result, three of the scheduled on-ice officials as well as Jeff Bradley, who was to have been the game supervisor, were stuck on the Coquihalla and backup officials were summoned. With Bradley in limbo, Robison stepped into the role of game supervisor, so was there to support Fryer. The WHL should have had someone — why not Robison? — address the media before the game and explain all of this, including the fact that the game’s start time had been moved to 8 p.m. Someone should have provided the media with the names of the scheduled officials and their circumstances, along with the names of the replacement officials and from where they were travelling. Someone should have explained that Robison had stepped into the role of game supervisor. Later, perhaps immediately after the game, someone from the WHL — why not Robison, as the supervisor? — should have met with the media and explained how the decision had been reached to overturn the call on the ice on Sideroff’s non-goal. Was there an angle, or angles, available in the video review booth that wasn’t shown on the big screen? Is the picture quality in the video review booth better than what is on the big screen? What role did Robison play in the process? In this case, of course, Robison was acting as the WHL supervisor. Doerksen refused to question the optics of the situation. On Tuesday, Ingram signed a three-year entry-level contract with the Tampa Bay Lightning, which selected him in the third round of the NHL’s 2016 draft. The contract includes three annual signing bonuses of US$92,500. So chances are Ingram can afford to pay the fine himself, should the Blazers suggest it. Hastings complete story, including a testy exchange with Doerksen, is right here. The second round of the WHL playoffs get rolling tonight with one game — the Swift Current Broncos and the Pats will get it going in Regina. The Pats (52-12-8) finished atop the overall standings, 24 points ahead of the third-place Broncos (39-23-10). Regina swept the Calgary Hitmen from a first-round series, while the Broncos went seven games in eliminating the Moose Jaw Warriors. Swift Current won Game 7 in Moose Jaw — the home team was 2-5 in that series — so playing on the road won’t be an issue. The Pats went 7-0-1 in the season series; the Broncos were 1-7-0. Of course, the Broncos are playing the underdog card. Sportsnet will show Game 2 of the series from Regina on Friday night and Game 3 from Swift Current on Monday night. Meanwhile, Shaw TV will televise the second-round series between the Medicine Hat Tigers and Lethbridge Hurricanes. That series opens with games in Medicine Hat on Friday and Saturday nights. The Tigers (51-20-1), who finished atop the Central Division, eight points ahead of the Hurricanes (44-21-7), were 4-3-0 in the season series. The Tigers scored at least five goals in five of those games, including games of seven, eight and nine scores. 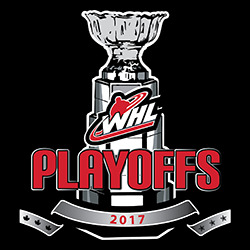 The two Western Conference series will open on Friday, with the Everett Silvertips playing host to the Seattle Thunderbirds, and the Portland Winterhawks in Kelowna against the Rockets. The Silvertips (44-16-12) won the U.S. Division pennant, finishing two points ahead of the Thunderbirds (46-20-6). Everett was 4-4-2 in the season series with Seattle, while the Thunderbirds went 6-4-0. In the 10 games, the winning team scored one, two or three goals on six occasions. The Rockets (45-22-5) wound up second in the B.C. 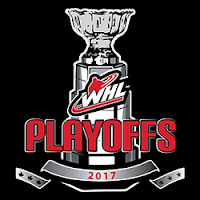 Division, while the Winterhawks (40-28-4) were fourth in the U.S. Division and are in the playoffs as the conference’s first wild-card entry. Kelowna was 3-1-0 against the Winterhawks this season. Kelowna won twice in Portland, 3-2 and 5-3, on Oct. 29 and 30. The Winterhawks won the most recent meeting, 5-4, in Kelowna on Jan. 28. The 2018 CHL Top Prospects Game will be played in Guelph‘s Sleeman Centre, home of the OHL’s Storm, on Jan. 25. Next year’s game will be the 23rd annual Top Prospects contest, an event that features 40 of the top NHL draft-eligible players from the OHL, QMJHL and WHL. This will be the first time the game will have been played in Guelph. Two more WHLers — D Josh Brook of the Moose Jaw Warriors and F Kyle Olson of the Tri-City Americans — have been added to the roster of the Canadian team that left Wednesday for Slovakia and the IIHF U-18 World Championship tournament that is to be played in Poprad and Spisska Nova Ves, from April 13-23. . . . As well, Moose Jaw D Jett Woo is with the team as an underage player, allowing him to gain international experience. . . . Canada will play exhibition games against Russia in Bratislava on April 9 and Switzerland in Piestany on April 10. . . . Canada opens tournament play on April 13 against Latvia. . . . On April 4, Hockey Canada named F Jaret Anderson-Dolan of the Spokane Chiefs, F Stelio Mattheos of the Brandon Wheat Kings and G Ian Scott of the Prince Albert Raiders to the team, and added Spokane D Ty Smith as an underage player. D Brendan Guhle of the Prince George Cougars has left to join the Rochester Americans, the AHL affiliate of the NHL’s Buffalo Sabres. Guhle, 19, played three games for the Sabres in December. . . . Ted Clarke of the Prince George Citizen reports that Cougars F Radovan Bondra, 19, will join the AHL’s Rockford Ice Hogs, who are affiliated with the NHL’s Chicago Blackhawks, while F Jesse Gabrielle, 19, is off to the AHL’s Providence Bruins, who are hooked up with the NHL’s Boston Bruins. F Evan Polei of the Red Deer Rebels is off to join the Bakersfield Condors, the AHL affiliate of the NHL’s Edmonton Oilers. Polei, who played four seasons in Red Deer, turned 21 on Feb. 19 so has used up his junior eligibility. This season, he had 33 goals and 29 assists in 69 games, then added three goals and six assists in six playoff games. However, he sat out the Game 7 loss to the host Lethbridge Hurricanes on Tuesday night as he served a one-game WHL suspension for a checking-to-the-head major and game misconduct he incurred in Game 6. F Brett Howden of the Moose Jaw Warriors will finish his season with the Syracuse Crunch, the AHL affiliate of the NHL’s Tampa Bay Lightning. Howden, 19, was taken by the Lightning with the 27th selection of the 2016 NHL draft. This season, he had 38 goals and 43 assists in 58 regular-season games. He added two goals and an assist in a seven-game first-round loss to the Swift Current Broncos. . . . Howden signed a three-year entry-level deal with the Lightning on Dec. 28. The Detroit Red Wings have signed D Dennis Cholowski, 19, to a three-year entry-level contract. The Red Wings selected him with the 20th overall pick of the NHL’s 2016 draft. Cholowski, from Langley, B.C., played two seasons with the BCHL’s Chilliwack Chiefs, then spent this season at St. Cloud State, recording one goal and 11 assists in 36 games. . . . Cholowski’s WHL rights are held by the Prince George Cougars, who selected him in the 10th round of the 2013 bantam draft. Mike Gabinet, 35, is the new head coach of the U of Nebraska-Omaha Mavericks. Gabinet had been the team’s associate coach. He played four seasons with the Mavericks. He later worked at NAIT in his hometown of Edmonton as an assistant coach with the Ooks, taking over as head coach for 2015-16. A year ago, the Mavericks hired him as associate coach. Gabinet takes over as head coach from Dean Blais, who resigned last month after eight seasons behind the bench. Gabinet now is the youngest head coach in NCAA Division I hockey. . . . Eric Olson of The Associated Press reported that Gabinet will get US$250,000 per year on a five-year deal, along with a country club membership and a car. There is a $20,000 bonus for a regular-season title, $50,000 for a berth in the Frozen Four, and $75,000 for a national championship. The Everett Silvertips received a request from the Hockey Hall of Fame in Toronto, so equipment guru James Stucky got right to work. The stick that F Cal Babych used in ending the longest game in CHL history on Sunday is on its way to the hall. The Silvertips beat the host Victoria Royals, 3-2, with Babych scoring in the fifth OT period.